The cultivation of oil palm (Elaeis guineensis Jacq.) on industrial plantations began after the introduction of some 04 palms by the Dutch to Indonesia in 1848 from Africa. Intensive breeding from this narrow genetic base of the South East Asian oil palm industry has led to limited variation within elite breeding population thereby reducing the rate of future progress in crop improvement. The use of wild genotypes are known to broaden the genetic base of breeding populations because of thier high rate of heterozygosity. 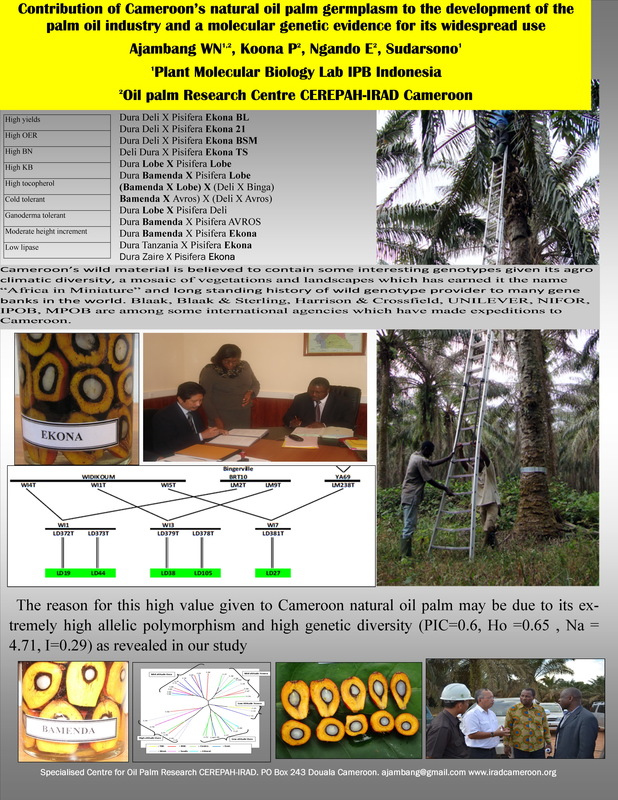 This paper is presented to highlight the contribution of wild oil palm populations of Cameroonian origin (collected by several foreign exploration teams, documented and undocumented) to the development of elite planting material and the palm oil industry in general. The result of these explorations have been the breeding of high yielding varieties, resistant to major pests and diseases and adapted to marginal conditions of altitude, drought and temperature. A majority of the varieties are produced from Pisifera of the Ekona origin while the others were developed using material from the Widikum, Lobe, Ndian and Bamenda origin. Recently, the Bamenda origin provided genetic material that is labelled ‘cold resistant’ and is being cultivated in semi temperate countries like Thailand and other high altitude areas. Currently, a majority of trials in many breeding programs are using parental material of Cameroonian origin to develop new varieties. The reason for this high value given to Cameroon natural oil palm may be due to its extremely high allelic polymorphism (96.43%) and high genetic diversity (PIC=0.6, Ho =0.65 , Na = 4.71, I=0.29) as revealed in our study. Keywords: Centre of origin, wild populations, parental material, germplasm, genetic variation, heterosis, contribution. This entry was posted in Mini Poster and tagged Kelapa sawit, Keragaman genetik, Marker molekuler, SSR. Bookmark the permalink.